Being a ninja is hard work. It takes years of training to learn the moves and a lot of ninja equipment to make you look great. A ninja sword is a great addition to the equipment list of any ninja. However a ninja sword shouldn't be the only piece of equipment you have as a ninja. In fact, throwing stars, chains, hand spikes, grappling hooks, nunchucks and many other pieces of equipment should be included in any ninja’s equipment list. Luckily, Twiggy's Treasures has all of these items available and more. All of our items are hand crafted out of the finest material on the market. They are also sold at incredible discount prices that are designed to save you money and help make it easier for you to pay for ninja lessons. Check out these incredible items to sample what we have available in our catalog. The four piece black ninja star set comes with a pouch for storing these sharp weapons. Each star comes with different points: a three point star, a four point, a five and even a six point star. All throwing stars are built with stainless steel to a length of about four inches. Chinese symbols printed on the sides complete the look of these beautiful stars. Buy this item at an incredible 50% savings. Ninja chains are designed to distract, disable and otherwise harm all ninja opponents. The Manrikiguasi Ninja Chain" is a 37 inch long chain attached to two different steel handles. Never use these items in a combat situation but instead use them for display. Each of these chains is sold at nearly 50% savings from the suggested manufacturer’s retail price. 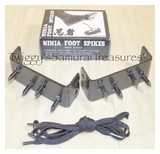 Hand and foot spikes are designed to increase the effectiveness of the ninja's hand to hand combat. The "Ninja Forearm Grapples" fit comfortably onto a wide range of different wrist sizes. Each is made out of comfortable leather and features three blunt stainless steel hooks coming out of each side. These Dark Knight designed forearm grapples are sold at a 45% discount price when compared to the original manufacturer’s suggested retail price. Twiggy's Treasure is also proud to sell a "Ninja Grappling Hook." These grappling hooks are built out of heavy duty black steel. Each hook is attached to 37 feet of black nylon rope. The rope folds easily to make it simpler to hold, store and transport. Each of these grappling hooks is available at a discount of 44% of the suggested retail price. Buying your ninja equipment from Twiggy's Treasures guarantees incredible savings with each purchase. All of our items are tested for strength and durability before being shipped. We are proud of our items and want you to be proud too.